Princess Ingeborg of Denmark (Ingeborg Charlotte Caroline Frederikke Louise; 2 August 1878 – 12 March 1958), was a Princess of Sweden by marriage to Prince Carl, Duke of Västergötland. She was the daughter of Frederick VIII of Denmark, and the maternal grandmother of Harald V of Norway, Baudouin and Albert II of Belgium, and the matrilineal great grandmother of Henri of Luxembourg. Princess Ingeborg was born on 2 August 1878 at Charlottenlund Palace north of Copenhagen as the second daughter and fifth child of Crown Prince Frederick of Denmark, the eldest son of King Christian IX. Her mother was Princess Louise of Sweden, the only surviving child of King Charles XV of Sweden and IV of Norway. In May 1897, Princess Ingeborg was engaged to Prince Carl of Sweden, Duke of Västergötland. Prince Carl was the third son of King Oscar II of Sweden and Norway and Sophia of Nassau. They were, therefore, first cousins once-removed. They married on 27 August 1897 in the chapel at Christiansborg Palace in Copenhagen and spent their honeymoon in Germany. Princess Margaretha of Sweden, later Princess Axel of Denmark (1899–1977). Princess Märtha of Sweden, later Crown Princess of Norway (1901–1954). Princess Astrid of Sweden, later Queen of the Belgians (1905–1935). Prince Carl Bernadotte, known as Carl Jr., later Prince Bernadotte, a Belgian title (1911–2003). In 1947, on the occasion of their wedding anniversary, her spouse admitted that their marriage had been completely arranged by their respective fathers, and Ingeborg herself added: "I married a complete stranger!" The marriage was popular because she was the granddaughter of the popular king Charles XV of Sweden and IV of Norway, and she was a personal success in Sweden. 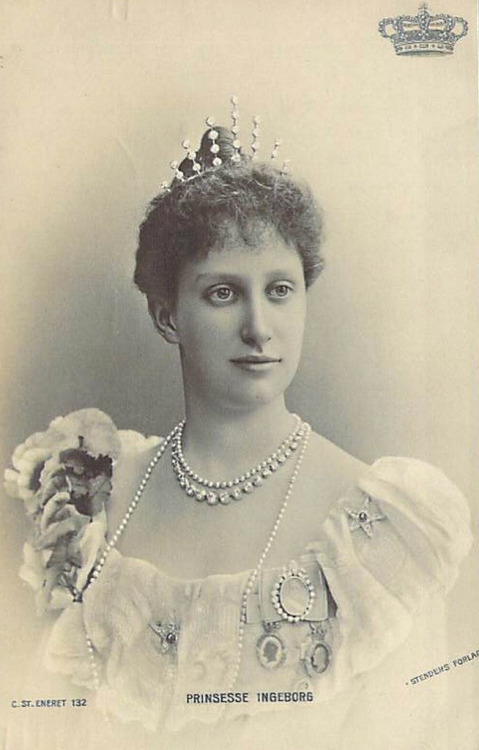 It was said of her, that of all foreign princesses married into the Swedish royal house, she was perhaps the one best suited to be Queen consort of Sweden, and for the first ten years in Sweden, she almost was: from 1897 until 1907, Queen Sophia seldom attended public events and Crown Princess Victoria spent most of her time abroad for health reasons, Princess Ingeborg was thereby given more public duties, unofficially performing much of the role associated with the queen consort at the Swedish court. She is perceived as having performed her representational duties with a combination of dignity and easygoing friendliness, and as attracting a social circle with her wit. Her sister-in-law, Crown Princess Victoria, however, did not approve of her informality and once remarked: "One does not enter the chamber of the Crown Princess of Sweden without knocking, even if one is Princess Ingeborg." Ingeborg was interested in sports, especially ice skating, and at the automobile exhibition of Stockholm in 1903, she and the Crown Prince, Gustav, made a spontaneous demonstration trip in a car from Scania. In 1908, she accompanied her husband's nephew Prince William to his wedding with her paternal first cousin once removed Grand Duchess Maria Pavlovna in Russia. She lived a harmonious family life, and the family was known as "The happy family". The children were given a simple upbringing, and expected to learn household tasks: they were, for example, given a real stove in their play cottage, on which they cooked real food. She and Carl lived an informal and intimate family life with their children. Ingeborg was admired for her handling of the economic difficulties experienced when a bank they invested in crashed in 1922 and they had to sell their home. She was portrayed as a symbol of a wife and mother in many magazines and was for many years the most popular member of the royal house. During World War II in 1940–45, she demonstrated publicly against Nazi Germany by blocking the window of her house which faced the German embassy in Stockholm. Princess Ingeborg has the distinction of being the grandmother of three European monarchs, King Harald V of Norway, King Baudouin of Belgium, King Albert II of Belgium, and the great-grandmother of two: Henri, Grand Duke of Luxembourg, and King Philippe of the Belgians. She is also grand-aunt of Queen Margrethe II of Denmark. ^ a b c d e Ingeborg C C F L, urn:sbl:11950, Svenskt biografiskt lexikon (art av Ragnar Amenius), hämtad 2015-02-27. Ingeborg C C F L, urn:sbl:11950, Svenskt biografiskt lexikon (art av Ragnar Amenius), hämtad 2015-02-27.